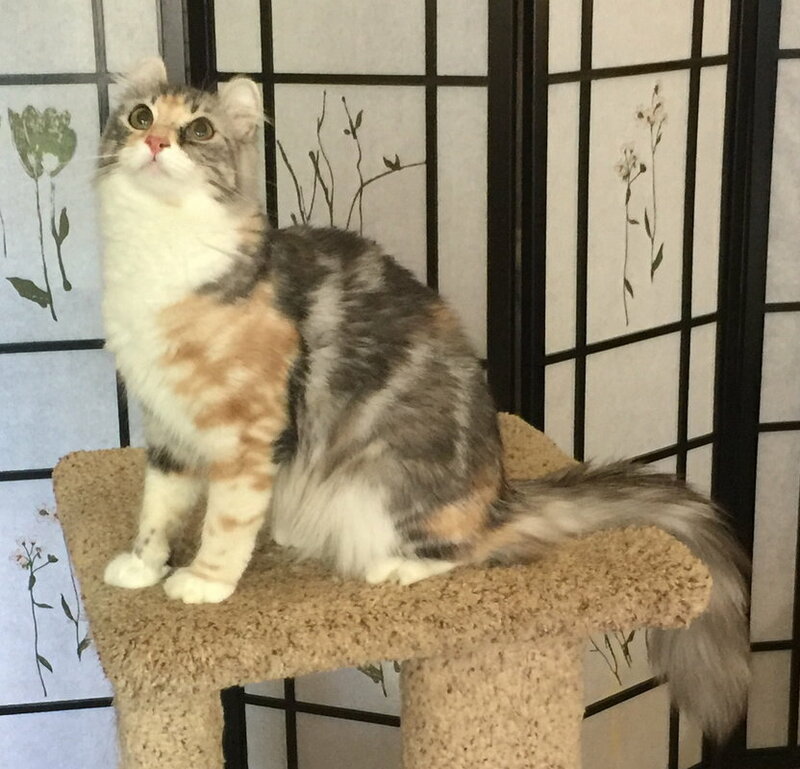 Buttercup is a calico. Technically, this is called a "silver patched and white". She is a new mom, but she's doing a great job with these babies. We just started playing with these 2 girls with this furry toy so I could take some new photos of them.... they were so cute, I decided to use all the pictures I took. Dad is Curl Essence Obsessed with Chocolate. We call him "Opie". 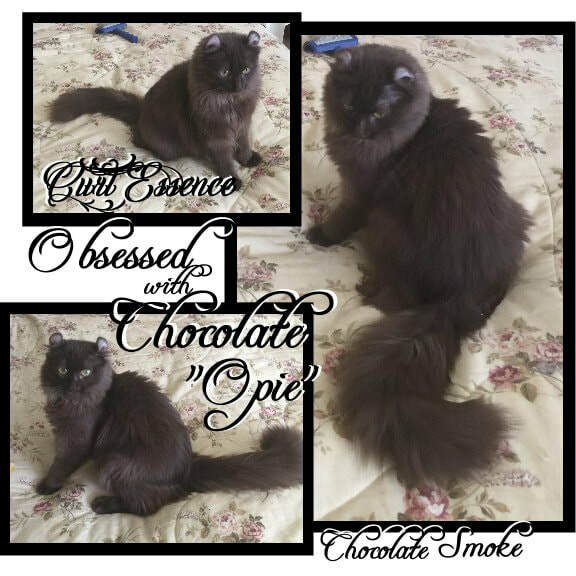 Opie is a chocolate smoke. This is a very rare color. We've never seen another solid chocolate or chocolate smoke in the US. There's a girl in the Ukraine that a solid chocolate, but she's the only other solid chocolate we know of. The little torti girl may turn out to be a chocolate torti but it's too soon to tell. Here are a couple pictures of these girls. I'm taking them inside their little home so photos will be dark. They are such huge play-meisters that all you have to do is swish the ball in the ball track or pull out a toy and swish it around in front of them and boom! they are right there. These girls are a kick to play with! Here's a couple new pictures for you to chuckle over. We haven't let them out of the master bedroom yet but only because they are so busy and active, I have no doubt that they would jump down to the downstairs below without figuring out they needed to take the stairs to get downstairs. Right now, they are sortof a "leap before you look" stage. We took this short video today for the new owners of Trix and Muffin. It's really cloudy and overcast so you may notice my shadow in the lights as I'm moving around to keep these 2 in the picture. Watch how they hop to chase the toy. Mike has decided to nickname Muffin PoGo because she hops straight up in the air sometime to chase the toys. Both LOVE, LOVE, LOVE anything with a bell on it and the laser light. Mike will lock all the other cats out of the room first thing in the morning to play with these 2 babies for a good 1/2 hr. to an hour. These two girls were so photogenic that I had trouble picking photos to post without filling the entire page so I'm going to just put my favorites in a slideshow for you. They are only 6 weeks old in these photos, but they are so strong and plump, they should be able to go to their new homes by the end of February. Check out the video we took when we took these stills. They were sooo, sooo cute! This was the first we had them out with the toys... they didn't take long to catch onto the game. Buttercup gave us 2 little girls.... and boy! are they well fed! Rather than creating a page of stacked photos, I' putting these in one big slide show. 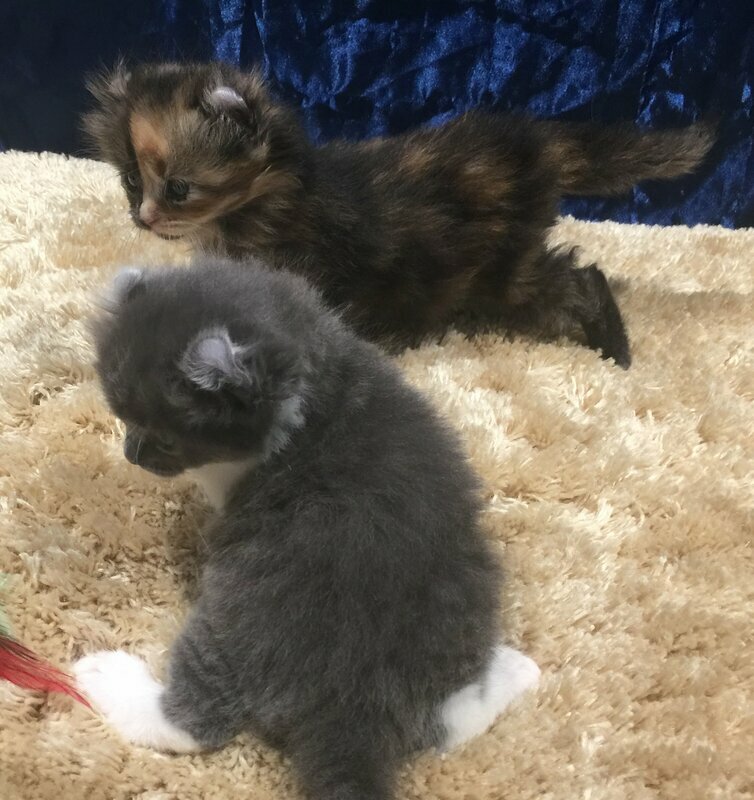 These girls are 4 weeks old in these photos.